Part One: What is new in our understanding of the association between muscle structure and the basic eating qualities of cooked meat? The book's first section explores new developments in our understanding of how muscle structure affects the eating qualities of cooked meat. The second section highlights new techniques for measuring, predicting, and producing poultry meat quality and how these new techniques help us minimize variability in eating quality and/or maximize value. 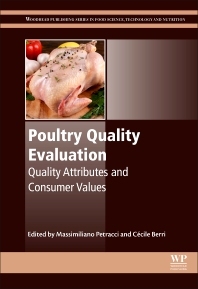 The final section identifies the current qualities of consumer and public perceptions, including what is sustainable, ethical, desirable, and healthy in poultry production and consumption. Dr Petracci began as Associate Professor at the University of Bologna in 2014. Massimiliano's research interests are directed in particular to the quality of the meat avicunicole a function of genetics, breeding, feeding and pre-slaughter. Currently his research focuses on the characterization of the main anomalies emerging poultry meat (white and striped wooden breast). Author of numerous publications, he has been invited to several invited papers at international conferences. From 2013 he has been Associate Editor of the Journal of World Rabbit Science and from 2014 coordinates the Working Group 5 "Poultry Meat Quality" of the European Federation of the World 's Poultry Science Association. Associate professor at the University of Bologna since 2014, his research activities involve several aspects of poultry and rabbit production and product quality. Research interests deal with particular emphasis on nutritional value and technological properties of poultry meat as affected by genotype, housing, feeding and preslaughter factors. Currently he is working on the characterization of the emerging meat abnormalities in poultry (white striping, wooden breast and spaghetti-meat). He is author of about sixty peer-reviewed articles and he jointed as invited speaker several international congresses. He is Associate Editor of World Rabbit Science journal since 2013 and he chairs the Working Group 5 “Poultry Meat Quality” of the European Federation of the World Poultry Science Association since 2014. In addition to his research responsibilities, he currently teaches courses on innovations in meat and egg processing and seafood quality. Current director of the INRA Avian Research Unit (Nouzilly, France), her research activities deal with the physiological control of muscle metabolism and growth in relationship with poultry meat quality. She has an expertise in muscle biology, functional genomics and meat science. Her main scientific contributions are the unraveling of the molecular pathways involved in the control of muscle glycogen and post-mortem metabolism and the study of the impact of the genetics and animal nutrition on poultry meat quality. She coordinated several research programs combining basic and applied researches to improve the sustainability of broiler meat production. She is the author of about sixty peer-reviewed articles and the co-inventor of a genetic marker controlling chicken breast meat color. She regularly join as invited speaker international congresses dedicated to animal and poultry science.